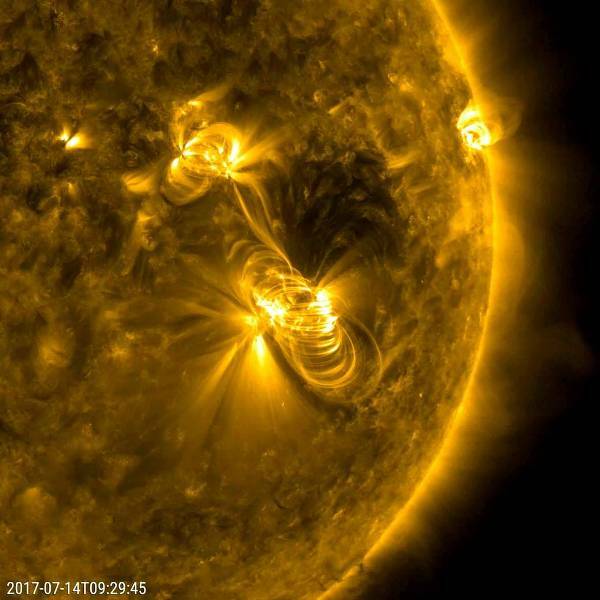 A medium-sized (M2) solar flare and a coronal mass ejection (CME) erupted from the same, large active region of the sun on July 14, 2017. The flare lasted almost two hours, quite a long duration. The coils arcing over this active region are particles spiraling along magnetic field lines, which were reorganizing themselves after the magnetic field was disrupted by the blast. Images were taken in a wavelength of extreme ultraviolet light. Solar flares are giant explosions on the sun that send energy, light and high speed particles into space. These flares are often associated with solar magnetic storms known as coronal mass ejections (CMEs). While these are the most common solar events, the sun can also emit streams of very fast protons – known as solar energetic particle (SEP) events – and disturbances in the solar wind known as corotating interaction regions (CIRs). The Solar Dynamics Observatory is managed by NASA’s Goddard Space Flight Center, Greenbelt, Maryland, for NASA’s Science Mission Directorate, Washington. Its Atmosphere Imaging Assembly was built by the Lockheed Martin Solar Astrophysics Laboratory (LMSAL), Palo Alto, California.